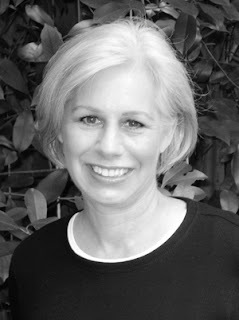 Today we are pleased to feature Patrice Barton, illustrator of over twenty picture and chapter books. Be sure to enter into her giveaway of her latest picture book, HELLO GOODBYE DOG, by Maria Gianferrari (Roaring Brook Press). Please tell us about your background and how you came to illustrate for children. I took the long path to illustrating for children. After earning a BFA in Studio Art from the University of Texas, Austin I held a variety of jobs. I worked as a house painter, needlepoint designer, copy shop tech, graphic designer, and finally as an illustrator for the state of Texas. Most of my time there was spent working on courtroom displays for the Texas Rangers, the Attorney General's Office, and any police agency in Texas that needed them. This work included visiting crime scenes, studying crime scene photos, reading case files, then drawing and designing posters or building models for the courtroom. Although this might sound intriguing to some, I realized I was not exactly CSI material. My most satisfying days were the ones I spent illustrating for children: coloring books on safety precautions, bicycle safety campaigns, trading cards for the drug sniffing dogs and their Troopers to hand out on school visits. As it happened, the coloring books and safety campaigns attracted my first freelance clients. 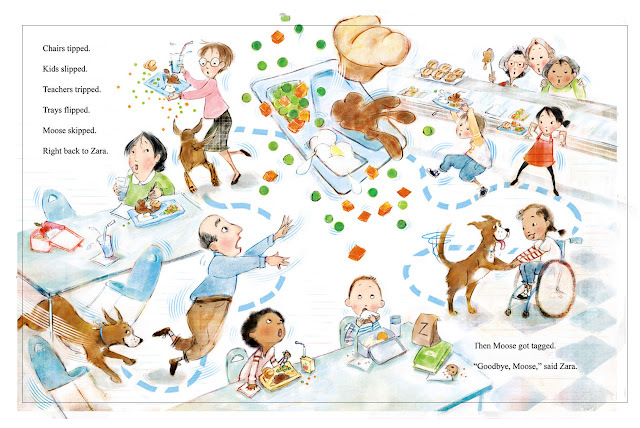 So, by day I worked on displays of fingerprints, blood splatters and crime scenes and at night at home, I freelanced illustrating for the children's market. After several years of building freelance clients I took a leap of faith, left the security of my day job and went full time freelance. 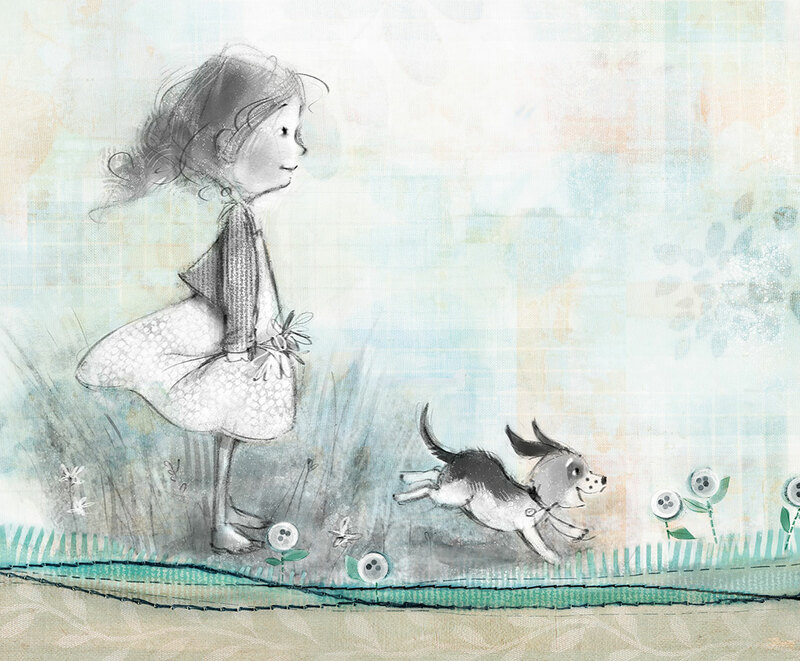 Congrats on your recent book, Hello Goodbye Dog, by Maria Gianferrari! Tell us how you approach illustrating a book like this when you first get the assignment. Thank you! When I begin an assignment, I read the manuscript over and over, letting it sink in, absorbing the story and the characters. I let it all simmer long before I start sketching. For this book, I did a little research for the main characters. For Zara, I visited a medical supply shop where I had recently purchased a wheelchair for my mother. I told them about the picture book and they were very helpful with pointers about wheelchairs for children. 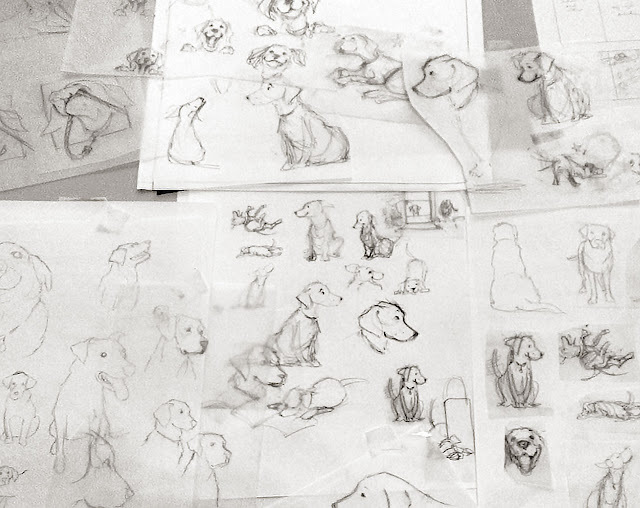 For inspiration drawing Moose, Maria sent me some photos of her sweet dog Becca. My own shepherd mix, Archer, was a helpful, although a bit reluctant, model too. I get asked this question quite a bit, and I always come back to the same answer… I'm inspired by little slices of life. A baby's belly laugh, dogs being silly, watching little kids interact as they walk home from school, baking with my son, people watching in general. All those little "everyday" moments tug at my heart and influence my work. 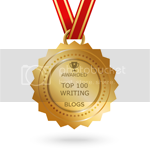 Was your road to publication long and windy, or short and sweet, or something in between? After my leap of faith to leave my day job and pursue children’s publishing, time seemed to fly by. I signed up for a local SCBWI (Society of Children's Book Writers and Illustrators) conference and had a wonderful time. I met other children's illustrators and writers, studied the industry, garnered a few assignments, signed with an agent and I haven't looked back. 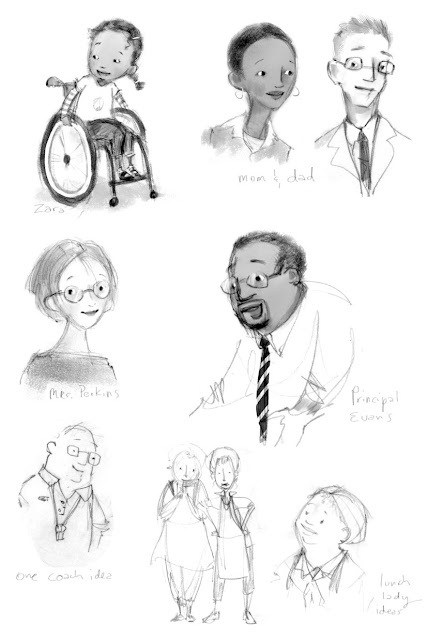 Currently, I’m working on a picture book titled REMARKABLY YOU, written by the very remarkable Pat Zietlow Miller, published by Harper Collins. What is your medium of choice? What is your illustration process? For sketching, my favorite medium is 2B and 4B graphite on tracing paper, copy paper or my favorite... design vellum. The vellum has a nice tooth, gives a nice tug against the pencil. Also it has a bright, clean contrast to the graphite. And a Moo eraser. For color, I'm digital. I scan in my pencil sketches, then use Corel Painter to paint. 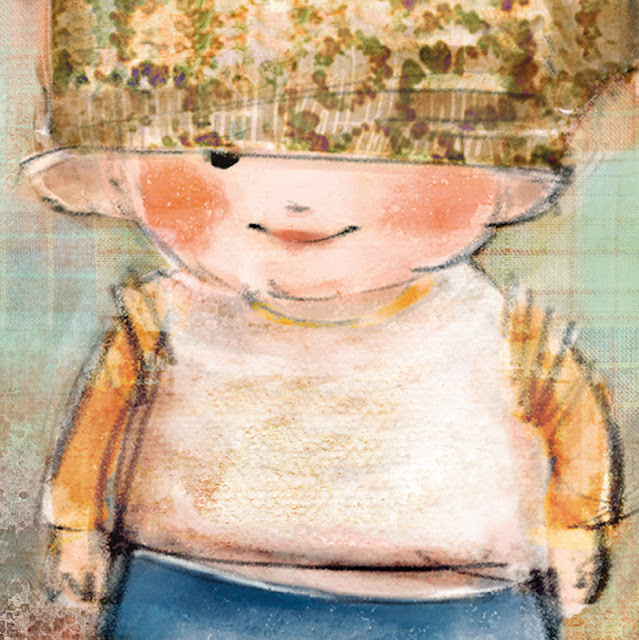 I also scan in bits of paper, textures, watercolor, etc into my illustrations. Always experimenting. My illustration process begins with lots of sketches, finding the characters. 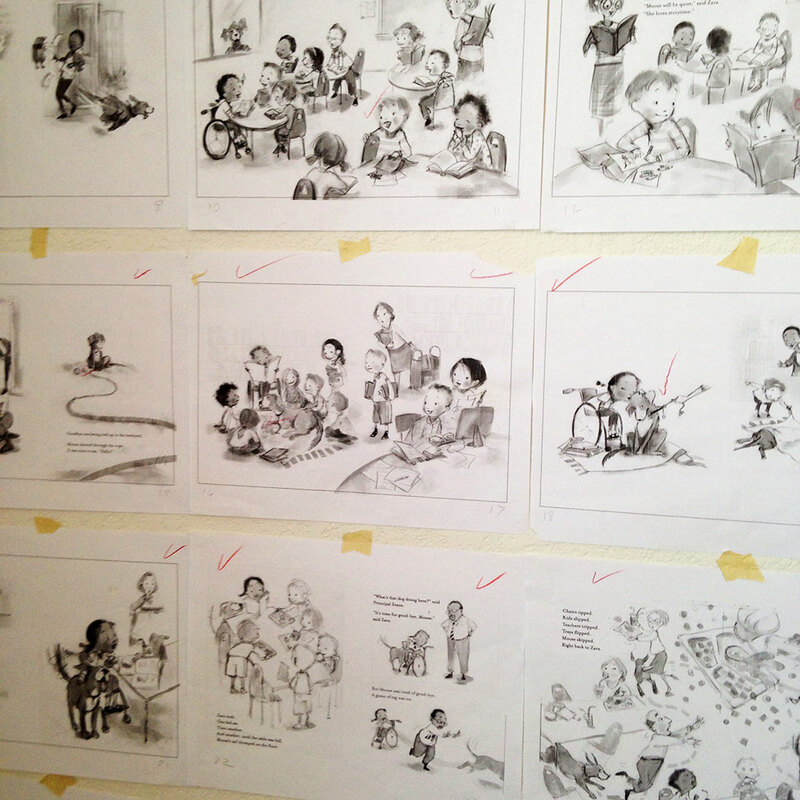 Then I start developing the spreads, taping them on the wall as I go, keeping an eye on the flow and pacing. I scan the sketches into the computer and work in Painter from this point on. Two things: First, when it comes to your work, try everything! Enjoy! Play! Be brave! Go out on a limb! If you go too far, you can always reel it in a bit. If you don't stretch, you won't know how far you can go. Second, sketch every day. The more you draw, doodle, scribble and sketch the better you get. That’s how you’ll find your own unique voice as an illustrator. I parachuted out of an airplane once. For fun. It was! Yay, Patty! Long time fan of your work, and you! 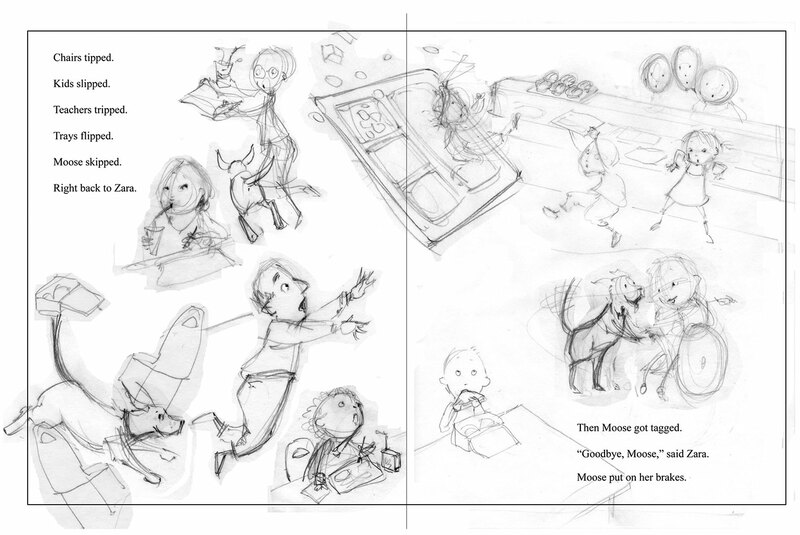 Love your latest book and it's so much fun to see the initial sketches, especially of Moose! I love Patrice's art!!! It's perfect for Maria's text and I thoroughly enjoyed this book. It was fun to see sketches and hear about process. Loved the interviews with Maria on her blog tour & love learning about the creation of the illustrations, too. Congratulations on a beautiful book. 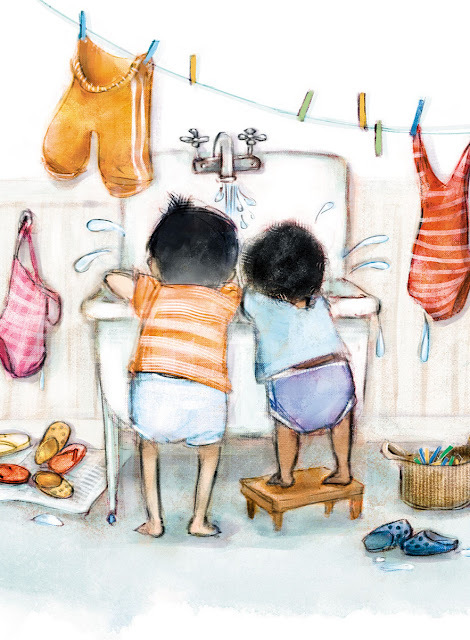 I always love hearing the illustrator's side of picture books. I found your research at the medical supply store inspiring. This book is close to my heart as I've always had a dog and currently have a former service dog that will be 13 this October. I love the freshness of Patrice's art. Love, love this book! The artwork is gorgeous. I have a special needs kiddo and she rarely sees herself represented in PBs. Well done! Enjoy the share of your journey to picture book illustration! 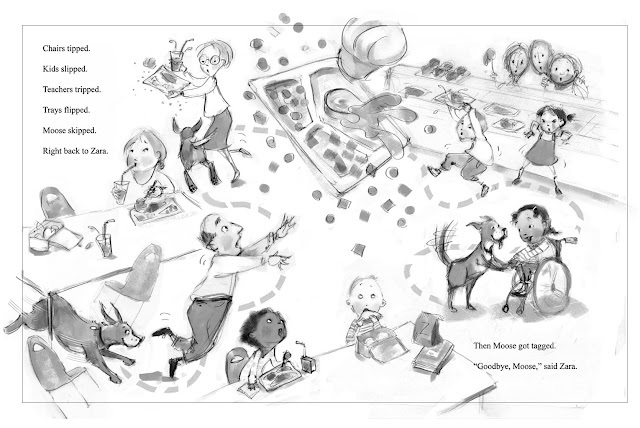 I loved reading about your illustrator journey and how you approach your work. Awesome illustrations!! Kids are blessed that you're providing them such wonderful picture books. I love Patrice Barton's illustrations. Thank you for sharing your process! Crime scene displays or children's illustrations? I think you made the right choice, Patrice. Thank you for all the kind words, Everyone!! 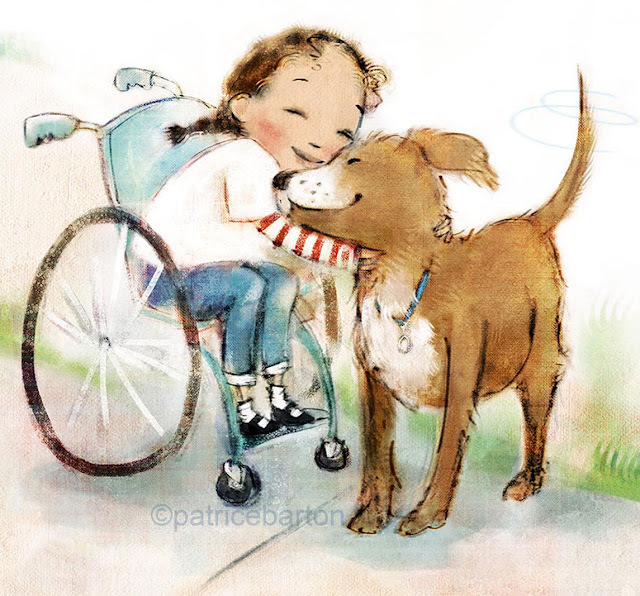 Thank you, KIDLIT411, for the opportunity to share my process and to celebrate the publication of our new book Hello Goodbye dog! Thank you for sharing your thoughts and illustrations! Patrice, I love your toddlers and dogs. 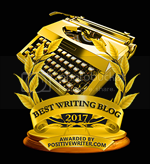 I am keeping your illustration style in my mind's eye for one of my manuscripts.